I really have been enjoying the chance to be at home more lately with my dogs and my kids and cooking in my own kitchen. There’s an ever shifting revolving group of kids, some bringing their own dogs, plus gals and pals around here. Dogs are some of the best people in the world. They were not put here to criticize control or judge you. They were put here to rescue us from our own ridiculous human condition and teach us about humor, loyalty, love, and forgiveness. All my life I have grown up with, played ball and tug of war with, slept in beds with, swam in pools with, driven around with, and had many conversations with a gang of some really great dogs. At one point two of my Springer Spaniels had 12 puppies so I was the keeper of 14 dogs for two and a half months on my farm. Good training for motherhood. They went from a playpen to the kitchen pen to the garage pen to the larger outdoor puppy proofed pen. There were horse corrals and puppy corrals separated by yards and yards of strategically placed hog wire. Every day of raising and socializing those puppies became one never ending hysterical situation after another. I would make large vats of rice cereal mixed with Costco sized quantities of goats milk. And the first day some canned red meat dog food was introduced into their diet there was suddenly a new sound of growls and their play became a little more aggressive. Containing them all and maintaining the system of feeding cleaning loving and caring for them got to be some serious hard work. But still l wanted to keep them all and I had a rough time giving each one them up when the time came. All 12 puppies went to good homes and a few even stayed within my family plus a few others went to some close friends homes as well and I was luckily able to see many of them grow up and thrive in their new families. Dogs were my kids when I didn’t know if I was destined or not to have any human kids of my own. A black lab named Zooey I adopted in Vancouver rescued my small fluffy terrier mix Womby when she followed some trick or treaters (and their candy) out into a dark and stormy Halloween night. Hours later Zooey brought her home bedraggled with her fur full of stickers and branches. Dogs do amazingly heroic things all over the world every day. They work to save people’s lives and instill love into the hearts of those who have been emotionally frozen. Dogs are just naturally good therapy for all us humans. The laws against dog and animal abusers should be enforced everywhere with the same heavy penalties as child abusers. Possibly and arguably the holder of the title of the worlds best dog was my Charlie. He knew a lot of you guys because he started touring with me when he was fairly young in 2002. 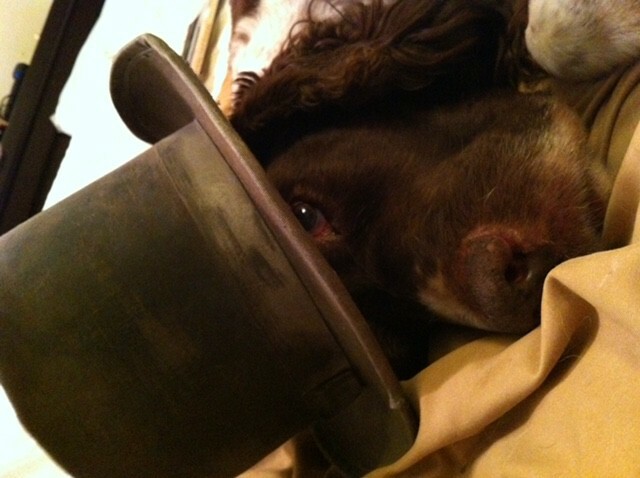 He was a large Springer with the disposition of a working therapy dog. Always helping. How else would he have survived the road so well? We devised a system of sharing a bus bunk in which we would spoon each other with his legs sticking straight out into the isle. There was no body of water that didn’t call out to Charlie. Such a true water dog to his core that even a large muddy puddle would do. There were many baths in hotel rooms and wow the poor maids after that! Leaving hotels required an extra 30 minutes just to navigate all the petting and adulation along the way to the bus… everyone loved Charlie and Charlie loved everybody. Needless to say any thief breaking and entering in the night would most likely be greeted with a warm heartfelt welcome! People have told me they’d like to be reincarnated as one of my dogs. Actually sometimes so would I !!! For one of the best dog stories in the world listen to Bruno the Fishing Dog as told by Garrison Keillor .You can also hear me read a great dog story called Karl the Grateful Dog (a story of rescue) by my guitar tech JeffO and his writer friend (Click here). My friend Karl has been on some rock stages with me like Charlie. Nothing like returning home to barks, yelps, and squeals of joy from three adoring bundles of love every time I return home…without fail. I was just wearing my official Charlie/Heart bandana the other day. He accompanies me to the gym regularly as well, keeping my brow dry. This is wonderful. I recently read The Art of Racing in The Rain. What you wrote about dogs being the best people reminded me of that. I don’t have any dogs of my own but I love them. Thanks for sharing this. I agree with you 100% on this one,Nancy! I don’t know how I could have survived life’s ups and downs without a dog in my life.Enjoy your time off, and I can’t wait to see you in Pittsburgh September 28th! Nancy, I was moved by your blog. Dogs do indeed keep us grounded and keep our hearts pumping full of love. They do keep us emotionally alive. I am forever grateful for my two dogs. They keep me humble and teach me to be less selfish. I appreciate you sharing these wonderful words- your stories & observations have the making of some great Heart song someday…maybe a tune dedicated esp. to Charlie! I worked at a shelter for three years. I have seen some of the worst animal abuse that people are capable of. Makes me want to push for that same cause–increase the severity of punishment for the abuse crimes caused by the evil people out there. These animals depend on us to defend them. I’ve always loved you and your music – and I’ve always loved you even more because you love dogs! What a great story!!! You are the best Nancy Wilson,thank you for loving animals!!!! HI, Nancy – Somehow I knew you must have been a dog-lover. Something about the openness of your spirit. (We’ve actually briefly three times.) I’ve also had quite a series of dogs. Actually, right now our Sinjin kind of ‘has us.’ He was a rescue, 1/2 Golden, 1/4 Husky, and 1/4 ‘mystery.’ This 14 year-old boy has never met a stranger. So many people who have been afraid of dogs, have been ‘cured’ by him. I’m so excited to see you with RR in October in Kansas City. Hopefully, I’ll get my buddy (your drummer) Ben to join me again for some barbecue. I wish you and the band great success with this venture. Sounds like you’re all having a blast. I absolutely identify with your need to keep pushing the edge of that creative envelope. Having been a writer, photographer, and videographer since… well, just about when you joined Heart, in the last 12 years, I’ve been painting, in acrylic, oils, epoxy, and encaustic. I find the crossover stretches me and makes me better at my original strengths. At least Sinjin thinks so. So good to have a forgiving audience like him. Long may you rawk. Be well, at peace, and by all means… receive and revel in the love that surrounds you. Truer words have never been spoken! I share your love for dogs and have never been without at least one in my life. Where would we be without family, music, and dogs? I’m so glad that you’re able to enjoy this precious time with all of your loved ones. You deserve all the love and blessings that come your way. Thanks for the music throughout the years, and for the light that you’ve been to so many of us. May it all come back to you exponentially! Best of love and success to you with RR and whatever endeavors this road of life may lead you to. I’ll be riding right along with you! Great story, Nancy! I share your love of dogs and how they are wonderful companions, healers, and protectors to us. We always had dogs growing up, too. Right now I have three! They are my kids! Like your guitar tech, I wrote a children’s book with a puppy as the main character. I’m still working with a company on the illustrations. I also recently decided to learn how to be a dog trainer and enrolled in a training program. Not sure exactly how this will blend with my current career as a Social Worker, but considering using dogs to help trauma survivors. It’s amazing how a wiggly and loving dog can help bring people to the present and out of the past. They are just amazing that way. Thank you for your story nancy your a great expressive writer. I loved horses i begged my dad for a pony,and at age 8 got a pinto shetland named mr.pony origional name huh?lol. He was the best and also a retired circus pony. He did tricks,and we swam together rode all over and he would even dry my tears with his lip when i cried. The joy he brought to my life was life changing . i often dream about mr. Pony and miss him to this day. They say animals know good souls and i tend to believe that. Thanks again for this opportunity to share with you my story one of many i might add. I have always let the dogs find me. Every single one who has shared my home. I’m dogless for the first time in 20 years since my dear friend Gracie passed and I’m just waiting for my next canine friend to show up! I love dogs too. I have Charlie Boy now but I have had other dogs before him. They really add soul to your life. Looking forward to the day that you will perform in Reno. I am going through weight loss surgery so who knows maybe a RR concert will be my reward for hitting one of my goals. I love your sound and spirit. I absolutely admire your love for dogs and I thank both you and Julia for allowing me to share my puggles with you. Lexie loves to dress up and send you all pics 🙂 Hello to the Frenchies!!!! LOL!!!! Oh how I would LOVE to have seen both pre and post Charlie hotel bath photos! 🙂 Your farm seems like a most precious place to live as a human and as an animal.